On this page you will find short reviews of some of the many high quality products we carry at Milk 'N Honey. We trust these reviews will be of help in making informed choices when shopping at our store. Curamin is a dynamic anti-inflammatory product that has produced significant results in relieving pain associated with arthritis and a variety of other inflammatory problems. It contains the herbs turmeric, boswellia and the amino acid dl phenylalanine. Turmeric contains the active ingredient curcumin which has been shown to act as a natural anti-inflammatory, antioxidant, antiviral, antibacterial and antifungal. The product Curamin contains a unique type of curcumin extract called Curcugreen (AKA BCM-95). Curcugreen is a very finely ground powder of curcumin blended with turmeric oils. Research has shown that the absorption and blood retention of this product is 8 to 10 times greater than that of standardized extracts. 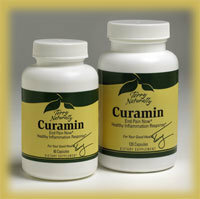 Curamin has been shown to inhibit the proliferation of tumor cells in vitro (in test tubes) and in some animal studies. Curamin has also been shown to break up beta amyloid plaques in mouse brains. Accumulation of amyloid plaque is a critical component in the development of Alzheimer's disease. In addition to curcumin, turmeric contains three analogues of curcumin called curcuminoids. As these analogues appear to play a role in turmerics health enhancing properties, they are included in this formula. Boswellia is an herb from India and contains acids and resins that have been shown to produce anti-inflammatory responses and have a positive affect on various skin diseases. A number of studies have shown the efficacy of boswellia in reducing swelling and stiffness in the joints. Phenylalanine is an essential amino acid, one that must come from the diet and is not made in the body. This amino acid is a proven pain reliever. Phenylalanine is widely distributed in the food chain and appears in various forms. In the product Curamin, it is in the form dl phenylalanine which is a form shown to be particularly effective in pain relief. Anyone having the genetic disorder Phenylketonuria should not ingest dl phenylalanine. Research has shown that inflammation is a major dynamic in the development of many diseases. Inflammation increases the production of free radicals which create the environment for additional inflammation. Studies show that keeping the lid down on inflammation does much to increase quality of life and greater longevity. Curamin is available at Milk 'N Honey in both tablets and capsules and at different potency levels. The herb turmeric is known for its anti-inflammatory benefits which appear largely tied to compounds called curcuminoids found in the fatty constituents of turmeric. Turmeric Force from New Chapter provides a broad spectrum of curcuminoids. By using supercritical extraction, New Chapter is able to provide a fuller spectrum of curcuminoids and then concentrate certain ones known to have demonstrated therapeutic levels, such as the curcuminoid curcumin. The supercritical process involves having carbon dioxide (C02) reach a critical temperature point beyond which it maintains its gaseous state and does not turn to a liquid. The critical temperature point is 31 degrees centigrade. If CO2 gas is heated up to any temperature over 31 degrees centigrade (which would be over, or “super” the “critical” point), then it will not turn to a liquid no matter what the pressure. At high compression, CO2 has the density of a liquid, but is able to penetrate deeply into an herb and dissolve the fatty constituents of that herb. When the pressure is released, the gas dissipates into the atmosphere or can be collected and recycled. What is left behind are the fatty constituents of the herb. This process has been found to not damage the herbal constituents in any way and there is no residue of the CO2 in the extraction. When done correctly, this process provides a broad spectrum of herbal constituents in a bio-available form. Water and alcohol extraction is also used to make available additional curcuminoid fractions. The difference between New Chapter’s turmeric and other turmeric products is that the spectrum of curcuminoids is much broader and thus may provide a wider spectrum of health benefits. This is accomplished by using only chemical solvent-free methods. 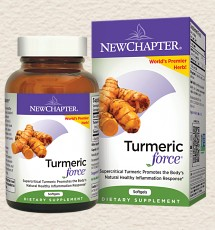 Turmeric Force provides a broad spectrum of naturally occurring beneficial anti-inflammatory and antioxidant compounds. The dull, yellow hue and watery texture of conventional fish oil supplements is symbolic of “purified” products. Such "purification" often uses high temptation distillation to remove contaminates. This process can fractionate, isolate, and destroy beneficial compounds that give fish oil its naturally vibrant color and clarity. 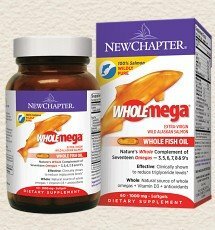 Wholemega contains Wild Alaskan Salmon Oil that comes from protected, recognized sustainable fisheries. This extra-virgin fish oil comes from only 100% wild fish stocks and does not include genetically modified or farmed salmon. By using only wild, sustainably caught Alaskan salmon – among the cleanest and most pure fish stocks in the world – chemical processing to deliver purity is not required. As a FOOD GRADE oil, Wholemega whole fish oil is extensively tested for detectable contaminants that other fish oil supplements must “purify” or distill out. An ingredient in coffee called chlorogenic acid has been identified as responsible for lowering blood sugar. Chlorogenic acid interferes with glucose synthesis and release in the body. It appears to do this by inhibiting the pathway of glucose-6-phosphatase, an enzyme that regulates production of glucose from non-carbohydrate substrates and glycogen released by the liver. This results in lowered glucose in the blood with the additional result of insulin activity being reduced which helps reduce production of fat-storing tissue. CoffeeGenic Green Coffee Extract is produced through a patented extraction process to deliver a high proportion of chlorogenic acid for maximum potency. The coffee beans sourced for CoffeeGenic Green Coffee Extract are organically grown. For optimal benefit, one vegetarian capsule of CoffeeGenic™ Green Coffee Extract should be taken before heavy meals. Each capsule is standardized to 50% chlorogenic acid. Each serving of the 200 mg product contains approximately 6 mg caffeine. This product is also available in a 400mg capsule. 400 mg of this glucose control compound was shown to induce a 24% drop in after-meal blood sugar after 30 minutes while a 200 mg intake generated a 14% drop. Weight loss has also been reported to take place when using green coffee bean extract. Inflammation is a natural process that affects every cell and organ in the body. 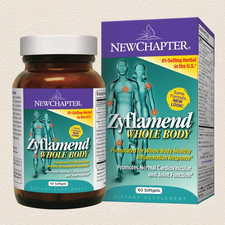 Zyflamend promotes a healthy inflammation response that helps support joint health and many other body benefits. Zyflamend has been studied at leading research institutions and has been shown to benefit multiple areas of health including joint health, skin health, bone health, and normal tissue growth. Results from human clinical trials show that this patented formula promotes a safe and natural modulation of inflammation. This product contains Rosemary, Turmeric, Ginger, Green Tea extract, Chinese Goldthread, Barberry, Oregano and Chinese Skullcap. Medicinal use of olive leaves dates back to ancient Egypt and is referenced by Hippocrates. Olive leaves contain powerful antioxidants and natural plant actives that are highly anti-microbial. Olive leaf is widely used around the world as a health tonic and all-purpose powerful antioxidant to promote general health. This herb can be of special value during the cold and flu season. Barlean's obtain their product from Australian olive groves where the olive trees grow in volcanic soils rich in minerals and fertilized organically. Harvesting is done at sunrise to ensure the leaves are at their peak freshness. The leaves are quickly taken to an on-site processing center where extraction of their vital nutrients is accomplished and the end product is vacuum bottled to maintain full spectrum nutritional potency. This product has an extremely high ORAC rating. ORAC means Oxygen Radical Absorption Capacity. This is a measurement of the ability of a substance to neutralize free radicals. Olive leaf has shown significantly greater ORAC than such super fruits as Acai and Goji. A primary constituent of olive leaf is oleuropein (pronounced oh-lee-or-oh-pin). The active ingredient in oleuropein is elenolic acid which has very strong anti-bacterial activity and inhibits the growth of viral and fungal organisms. The research to date shows olive leaf to contain constituents that selectively block the entire virus facilitating process in an infected host and therefore appears to offer healing effects not addressed by pharmaceutical antibiotics. One clinic that uses olive leaf to treat patients reported improved psoriasis, normalization of arrhythmia's (heart beat irregularities), healing of chronic toenail fungal infection and relief from allergies. Olive leaf has been shown to be effective in treating the herpes virus which causes everything from chicken pox and singles to cold sores. In1992, French biologists found that all of the herpes viruses were inhibited or killed by extracts from olive leaf. Research indicates olive leaf extract may help reduce blood pressure, blood sugar and uric acids levels. Pharmacologists at Spain's Granada University determined that olive leaf extract causes relaxation of arterial walls in laboratory animals. Barlean's Olive Leaf Extract comes in a very tasty liquid and one tablespoon per day will add to your protection against viral, bacterial and fungal attack. FücoTHIN is a weight loss product containing an extract from brown marine seaweeds called fucoxanthin combined with pomegranate seed oil. Fucoxanthin is a carotenoid like beta carotene and has been clinically shown to have a thermogenic effect. Thermogenesis is a process where metabolic rate is increased in association with the burning of stored body fat, especially in the belly area. In human clinical trial, the metabolic rate with FücoTHIN was 18.2% higher than with diet alone. Three softgels of FücoTHIN, which is the recommended daily serving, contain 15 mg of fucoxanthin. FücoTHIN contains a minimum 5% concentration of fucoxanthin. Preliminary results from a 2007 double-blind, randomized, placebo-controlled clinical trial of FücoTHIN involving 140 overweight female subjects showed that after 16 weeks there was a significant reduction in visceral fat and body weight. Study participants lost an average of 14.5 pounds of body weight, 11.5 pounds more than the placebo group. Body fat loss was 11.8 pounds in the fucoxanthin group, compared to just 2.8 pounds in the placebo group. 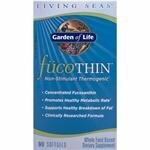 The research on FücoTHIN was done in conjunction with an 1800 calorie meal plan. FücoTHIN is non stimulatory and will not cause any jitters. This high quality protein powder is made from goat milk and contains a combination of whey and casein protein. Whey protein contains 18 amino acids and is high in branch chain amino acids which are very important to muscle growth and maintenance. Whey protein breaks down quickly into its amino acids and becomes readily available for use by the body. Whey protein is excellent for promoting new muscle growth but does little to maintain such muscle. That is where casein protein comes in. Casein protein releases amino acids more slowly into the body and provides long term support for repair, strengthening and maintenance of muscle tissue. Casein is especially helpful in weight training where muscle tissue is more readily broken down and must be rebuilt over a period of time. Casein protein inhibits muscle breakdown and thus preserves muscle tissue. With Mt. Capra Doubled Bonded Protein, you get both of these proteins in one product which provides you with both short and long term support for the development, repair and maintenance of muscle tissue. Mt. Capra Doubled Bonded Protein gives you the added benefit of being derived from goat milk. Goat milk protein has been shown to be utilized very well by the body. The goat milk used for this product is taken from goats raised on a Mt Capra farm located in the Pacific Northwest. The goats are free range grass fed animals. No pesticides or chemical fertilizers are used on the land and no hormones or antibiotics are given to the animals. This product is available in both vanilla and chocolate flavors. Both taste great. Organic cocoa powder is used in the chocolate flavored product for a delicious chocolate taste. Serving size is two heaping scoops which provide 20 grams of protein. This product can be used in water, juice or any non-carbonated beverage. For better mixing, this product should always be shaken vigorously in a beverage container. There are approximately 30 servings per container. Milk ‘N Honey carries a product called StemEnhance. StemEnhance contains two compounds extracted from a certain species of Blue Green Algae that has been shown to increase the release of stem cells from the bone marrow into the blood stream. One gram of StemEnhance has been shown to produce a 25 to 30% increase in the number of circulating stem cells. Blood samples of volunteers were tested to determine the base line number of circulating stem cells. Part of the group was then given StemEnhance and part of the group was given a placebo. Blood samples were then taken at intervals of 30, 60, and 120 minutes. The group taking StemEnhance was found to experience a 25 to 30 % increase in the number of circulating stem cells whereas the placebo group did not experience such increase. Stem cells are specialized cells found in various tissues of the body, and in abundance in the bone marrow. These cells are able to travel to various areas of the body and convert to the particular cells that make up the targeted area. For example, if the heart is in need of repair, it releases a chemical called Stromal Derive Factor (SDF1) which signals the release of stem cells from the bone marrow which then circulate to the heart to facilitate repair. These stem cells essentially convert to heart cells. This same process is involved in repair of muscle, nerve, skin, brain, joint, liver or any other tissue in the body. Increasing circulating stem cells has been shown to increase the body’s ability to heal itself. By stem cells becoming the actual cells of the targeted tissue, such tissue is renewed. The bone marrow of a human contains an estimated 50 million stem cells at any given time. As we age, the bone marrow begins to lose the ability to respond to signals that call for stem cells to be released. StemEnhance has been shown to increase the release of stem cells from the bone marrow which the body then uses to repair tissue as needed. Two grams of StemEnhance cause the release of approximately four million stem cells into the blood circulation. Many users of this product have reported significant improvement in a variety of health challenges. When male sperm fertilizes a female egg, the first cells produced are stem cells. These cells divide into more stem cells and this process continues until these stem cells begin to differentiate into specific types of cells such as those that make up the heart muscle, brain tissue, bone, cartilage, etc. Early on in stem cell research it was recognized that stem cells extracted from human embryos and placed in a test tube rapidly replicate themselves and can be coaxed into becoming the cells of almost any body tissue. Once transformed into the specialized cells of a particular body tissue and injected into the body, they are seen to repair the targeted tissue. The objection to this approach is that embryos from which stem cells are extracted are destroyed in the process. There also have been many difficulties encountered to date in transforming embryonic stem cells into other types of cells. Stem cells extracted from the blood of the umbilical chord have proven to be useful and don’t create controversy since the umbilical chord is a birth waste product. Stem cells can also be extracted from adult tissue such as bone marrow. While such stem cells do not replicate as readily in a test tube and therefore are not as readily converted to useful cells for repair of body tissue, they are, nevertheless, being successfully used for this purpose and as research continues in this area it is being discovered that stem cells derived from adult tissues are becoming more and more useful. The National Institute of Health has identified 74 diseases that can be treated by using adult stem cells. The procedure involves first harvesting stem cells from the patient or an adult donor. These cells are then programmed in a laboratory procedure to become a specific type of cell. These transformed cells are then reintroduced into the patient’s body. Because of tremendous expense, this procedure is only done where there are serious health problems. It has been shown, however, that a small but consistent release of stem cells into the circulation on a daily basis can result in significant health benefits. The science behind StemEnhance is simply saying that if you increase the number of circulating stem cells in the blood stream, the body will have greater ability to repair diseased or worn out tissue. By persuading the bone marrow to release more stem cells into the blood stream, the need to introduce stem cells from outside the body is circumvented and yet the result can be the same. Since the bone marrow is constantly producing new stem cells and does so all your life, there is no danger of depleting the availability of such cells. Stem cells that are not used by the body return to the bone marrow. STROKE: Medical doctor David Darbro, suffered a stroke that caused slurred speech, and slow mental response. After using StemEnhance, short term memory improved and normal speech returned except for an occasional slurred word. DIABETES: Gerrit Woning could not keep his blood sugar below 200 even with regular injection of insulin. After eight weeks of using StemEnhance, he was able to discontinue using insulin and is able to maintain normal sugar levels. His high blood pressure has also disappeared along with floaters in his eyes. PARKINSON’S DISEASE: George Guyatt was diagnosed with Parkinson’s and symptoms included loss of memory, difficulty walking and tremors. 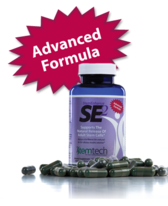 After using Stem Enhance, memory improved and walking returned to normal. A neurologist could fine little evidence of the Parkinson’s that had been previously identified and confirmed by four different doctors. Those using StemEnhance have reported faster healing from injuries, improved vision, greater mental clarity, elimination of the pain of arthritis, reduction in anxiety and depression, relief from breathing difficulties and relief from a host of other health problems. In April 2007, The Journal of the American Medical Association reported a study done in England that showed stem cell therapy to restore insulin production in type 1 diabetics. Fifteen young patients were given injections of stem cells obtained from their own blood. The result was their bodies began to naturally produce insulin again. A report published in England in March of 2007 tells of patients with only 20% liver function having their livers restored with stem cell therapy. Stem cells were removed from the hip of these patients and injected into the blood supply. Five weeks after the stem cell transplantation, enough healthy liver had grown where doctors were now able to remove cancerous tumors. Researchers extracted stem cells from the brain tissue of mice with a form of multiple sclerosis. These cells were injected into the bloodstream or spinal chord of these same mice. It was found that the injected stem cells had migrated to and repaired damaged areas of the nerves and brain, including the myelin sheath. StemEnhance is available at Milk 'N Honey and comes in a 60 capsule bottle with each capsule containing one gram of the Blue Green Algae extract. Results have been obtained by taking two capsules per day. More can be taken. StemEnhance is the only product of its kind currently in the market place. Our bodies understand and seek whole food sources of nutrition. That’s why New Chapter formulated Bone Strength with a whole-food plant source of calcium, magnesium, and other important trace minerals. 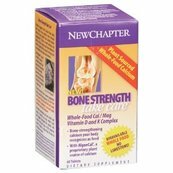 In addition to whole-food calcium, magnesium and trace minerals, Bone Strength is formulated with a proprietary blend of whole-food vitamins designed to optimize calcium absorption and utilization. This blend provides a highly bioavailable, bioactive, and long-lasting form of natural Vitamin K2 (MK-7). Vitamin K2 is the most active form of Vitamin K in bones and arteries. This key nutrient helps put calcium into our bones where we need it, and helps keep calcium out of our arteries, where we don’t. This complex of nutrients includes Vitamin D3 which is important for calcium absorption and has been found to aid in bone support and function. New Chapter creates whole-food complexed Vitamin D3 by culturing the nutrient with probiotics and organic whole foods. FROM THE COMPANY "LIFE OF BALANCE"
This product is ground up flax seed containing 4,600 milligrams of omega 3 linolenic acid and 1,200 milligrams of omega 6 linoleic acid per serving (2 rounded tablespoons). These two fatty acids are critical to our heath and must be obtained from the diet as our bodies do not make them. The average diet is very deficient in omega 3 linolenic acid. Fortified Flax also provides 6 grams of fiber per serving broken down into 4 grams of insoluble and 2 grams of soluble fiber. This product provides 190 milligrams of potassium per serving and a variety of other minerals, vitamins and amino acids (proteins). Fortified Flax provides 85 milligrams of lignans per serving. Lignans are chemical compounds found in certain fibers that have been shown to be protective against breast and prostate cancer. Fortified Flax has a flavorful nut-like taste and can be eaten right out of the bag or added to cereals, yogurt and various baked products. At Milk ‘N Honey we make available a number of high quality fish oils which provide the important EPA and DHA omega-3 fatty acids. Here we will highlight a product that provides these fatty acids in a very unique format. It is called Vectomega and is marketed by the company EuroPharma. We all know the omega 3 fatty acids in fish oil are very beneficial to our heath. EPA (eicosapentaenoate acid) is important to the health of our cardiovascular system and DHA (docosahexaenoic acid) is essential to proper brain development and neurological function. These acids are critical to the maintenance of all mucus membranes and the production of anti inflammatory activity in the body. EPA and DHA omega-3 fatty acids are found in cold-water ocean fish such as herring, cod, salmon, mackerel, sardines, anchovies, black cod, and albacore tuna. These fish eat phytoplanktons which are single celled algae rich in these fatty acids. In 2001, researchers in France began to investigate potential uses of marine extracts. This research proj­ect led to a unique manufacturing process which extracts from the heads of salmon marine phospholipids that are com­plexed with EPA and DHA through a process called vectorization. Vectorization uses a gentle cold-water and enzyme extraction process which allows the EPA, DHA and phospholipids in the oil to remain in their normal configuration. The extraction of the oil is carried out in less than an hour in an inert atmosphere at a temperature of less than 60 degrees centigrade. No chemical solvents are used. This method provides a very stable product that is very well utilized by the body. This process has been shown to offer superior protection from oxidation of the EPA/DHA fatty acids. Clinical studies have shown that the composition and position of fatty acids affects both bioavailability and digestibility of fats and oils. The vectoriza­tion process has been clinically demonstrated to produce fatty acids having superior bioavailability. Research has shown that ingesting EPA and DHA that is complexed with phospholipids creates up to 50 times more absorbability via cell membranes than EPA/DHA that is not complexed in this manner. This technology of complexing phospholipids with EPA/DHA fatty acids led to the development of a omega -3 containing product called Vectomega. Clinical studies using Vectomega have been impressive. A recently concluded open clinic trial in Europe provided 40 healthy human subjects two Vectomega tablets per day which provided 32.8 mg of DHA and 10.4 mg of EPA per two tablets. Without any modifications to their diet or exercise habits, after sixty days, the subjects experienced a 16 percent decrease in triglycerides, a 10 percent decrease in total cholesterol and a 13 percent increase in HDL Cholesterol (the good guys). In comparison, traditional fish oil studies that have obtained similar results to this Vectomega study, did so by their subjects having to use a range of 3.6 grams to 4 grams of fish oil per day equaling approximately 3,400 mg per day of combined DHA and EPA. This comparison shows the greater absorption and bodily utilization of these important fatty acids extracted by the vectorization process as much less produces the same results as a great deal more in some other fish oil products. There are five types of phospholipids in Vectomega. One is called phosphatidylcholine which assists in the introduction of DHA into the heart muscle. Another one is phosphatidylserine which is a critical brain nutrient. All the phospholipids in Vectomega perform various functions in the body in addition to providing a vehicle for rapid absorption of EPA and DHA. Phospholipids are known to rapidly enter cells requiring high renewal. Brain tissue renews 10 percent of its phospholipids everyday. Because of this complexing of EPA/DHA with phospholipids, Vectomega provides a highly absorbable grouping of necessary fatty acids. These fatty acids act to facilitate membrane integrity, cardiovascular wellness and neurological health. The pomegranate fruit has been shown to contain compounds that appear to provide protection from tumor development in breasts, the prostate gland and the colon. Research shows that the best results are obtained from the seed and seed oil. The seed oil is rich in punicic acid which is considered an omega-5 fatty acid. This acid has been shown to have some of the same effects in the body as the anti-cancer drug tamoxifen but without the negative side effects. A study published in 2010 in the International Journal of Oncology revealed that punicic acid supported apoptosis (programmed cell death) by 86 and 91 percent in two types of breast cancer cells. In another study, men with high PSA levels, which can indicate prostate cancer, had their levels drop after drinking pomegranate juice for several years. Another study published in Growth Hormone & Research, showed pomegranate induced programmed cell death in prostate cancer cells and research reported in the journal Investigation New Drugs, revealed that pomegranate fractions inhibited the growth of prostate tumor cells. At Milk 'N Honey, we carry a product simply called Pomegranate Seed Oil. This product is an extract of pomegranate seed and seed oil. Taking two softgels of this product is equal to drinking fourteen ounces of pomegranate juice. Pomegranate juice often contains added sugar and will not have the levels of important constituents that are found in the seed and seed oil as is true of this product. For more information on the benefits of pomegranate, go to The Wonders of Pomegranate.